Your Favorite Kitty is Here! Description: The Hello Kitty Bounce House features the infamous japanese bobtail cat sporting a red bow. 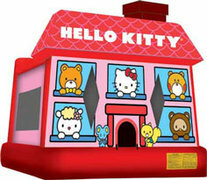 Hello Kitty is our newest bounce house rental that's guaranteed to suprise your little girl at her birthday party. Rent it here, exclusively from KINDAS Amusement Source.